The whirlwind that is Signing Day is over, but now BYU football gets to reap the rewards. Here are five underrated 2017 commits. Depending on where you look, BYU football’s recruiting class ranks somewhere around 60th in the nation. 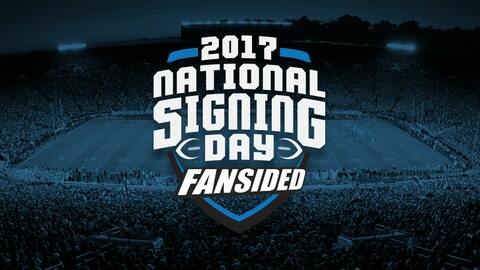 While that may be disappointing to some, there’s no denying that BYU got much better on Signing Day. The Cougars recruited in the state well, and secured the services of some great, non-LDS athletes. They got the players necessary to revamp their defensive line and added depth on the offensive line. Overall, it was definitely a successful day, regardless of rankings. But don’t let the stars next to these fives players fool you. Here are five underrated BYU football recruits. Batty looks like a real play maker. He’s got really nice size at 6-foot-5 and 230-pounds and uses that size well. Batty’s got an explosive first step and uses his arms well when rushing the passer. He’s a good tackler as well. Basically, Batty passes every eye-test you’d want a defensive lineman to pass. Plus, he held an offer from Utah – and the Utes know a thing or two about defensive linemen. Offensive coordinator Ty Detmer and offensive line coach Mike Empey are really excited about Willis. When you watch his film, it’s not hard to see why. Willis is strong kid that plays with a mean streak (which is always a good thing for offensive linemen). He’s a good run blocker, and his footwork in pass protection looks good as well. The only gripe I have with him is he comes out of his stance high. However, that’s a problem a lot of high school o-linemen have, because the good ones are strong enough to out-muscle their competitors. In short, it’s a problem that won’t take long to fix. Speed kills. And Buchanan has it. He was an excellent sprinter in Texas (10.8-second 100-meter dash), and he translated that speed onto the football field with ease. He’s also got great size for his position, solid hands and might be the deep threat that so many BYU football fans were longing for this season. He can take the top off of coverage – and with Mangum under center, the Cougars will be slinging the ball. Zo Fauatea is a big get for BYU football. It’s not often a three-star player is underrated, but Fauatea is a very legit talent. He had offers from big-time schools, and was a standout at the All-Poly football camp. He collected 15.5 sacks as a senior at Hunter High School. Fauatea is very explosive, but also has great size. He is the type of end that was a staple of Kalani Sitake and Ilaisa Tuiaki’s defense while the duo was at Utah. Pin his ears back and watch him go. Again, three-star players might not come to mind when “underrated” is thrown around. But, Gunter looks like a true lock-down cover corner. He’s got great instincts in coverage and he finds the ball well without committing penalties. Tuiaki raved about Gunter during the Signing Day festivities. Cornerback is typically a need in Provo – it’s tough(er) to sell top-notch athletes on BYU. But, Gunter – along with Troy Warner, Dayan Lake and Chris Wilcox – might help change that. Gunter immediately reminds me of former Utah cornerback Eric Rowe. Gunter is listed at 6-foot-1 and 175-pounds. When Rowe was coming out of Klein High School in Texas, he was listed at 6-foot-2, 180-pounds. I think Gunter – like Rowe – can be a man coverage nightmare for opposing offenses.